It has been a while since the last article and a lot has changed since then. In my previous article Construction Begins we had just cut down the trees to clear space for the cottage. That alone was a huge visual change after looking at the densely treed lot for more then a year. Once those trees were cleared it didn’t take long for the site to be ready for concrete to be poured. The site excavators stripped back the top soil and were only able to dig down 2ft for the foundation because of the high water table. Digging down any lower would leave them swimming. I had scheduled about 2 weeks for excavation to be completed and I got a call 3 days in saying they were done! I needed to get a foundation contractor in there quickly to set the footings before the soil was disturbed too much. I asked my excavating contractor if he knew anyone and he put me onto a guy that was very professional so I went with him. 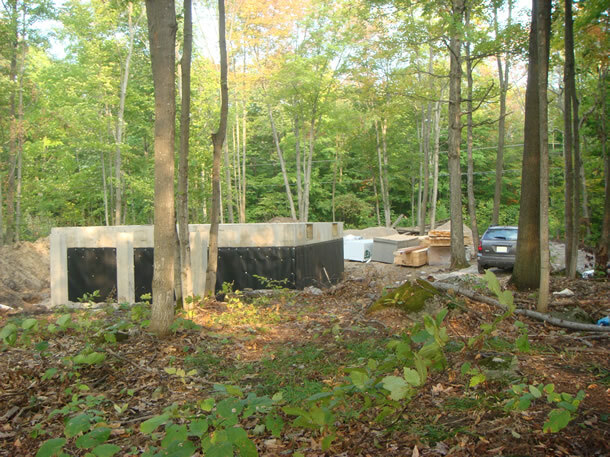 With the foundation finished I needed to find some framing contractors to build the cottage. Look for my next posting on framing.